Women who are struggling to style their frizzy, curly or wavy hair should consider using a flat iron to smooth and straighten it. Flat irons are an easy way to add variety to your hairstyles. You will need to know the proper way of using a flat iron to achieve a super straight look. There are several things you should do before and after using the flat iron to get your hair really straight such as using styling products and blow drying. Wash and condition your hair in preparation for the flat iron. After washing, use your hands to squeeze out the excess water. Apply a hair serum or spray that contains a thermal protection formula to decrease damage to your hair from the blow dryer and flat iron. Use a comb to spread the hair protecting product from your roots to the end of your hair. Make it easier to flat iron your hair by first blow drying your hair straight to reduce the amount of waves or curls in your hair. To begin blow drying, divide your hair into sections and clip back all but one. Use a paddle brush to hold the section of hair straight as you dry from the roots to the ends. 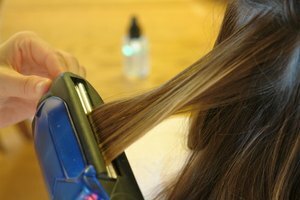 Direct the heat from the blow dryer down the hair shaft to reduce frizziness and keep the hair smooth. Section off your dry hair with clips before using the flat iron. 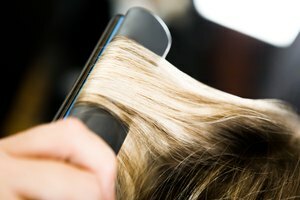 Each section of hair you straighten should not be thicker than half the width of the flat iron's heating plates, according to the Hair Finder website. Spray each section with a small amount of hairspray, allowing it to dry before straightening. Set the flat iron on an appropriate heat setting for the texture and thickness of your hair. Run the flat iron slowly from the roots down past the ends without stopping. Some sections may require extra passes from the flat iron depending on the frizziness. Brush your hair after flat ironing each section and run the flat iron over any parts where you might have missed during the initial straightening. Finish by applying a styling product such as a hair serum or styling cream from the roots to the tips to keep the hair smooth. If your hair is not excessively curly of wavy, allow your hair to dry naturally to avoid any possible heat damage from a blow dryer. Do not use a flat iron on wet hair unless you have a wet-to-dry straightener. Do not add too much hair serum after flat ironing or your hair will look greasy. 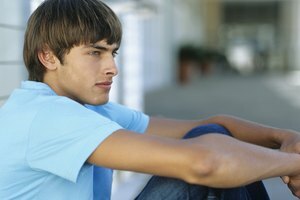 How do I Remove Waves From Hair?